Troop 363 Cleans Up at "Scouting the Zoo"
"Scouting the Zoo" is an annual event offered by the Three Harbors Council where Boy Scouts can camp inside of the Milwaukee County Zoo. Each troop makes a scout skill presentation, promoting Scouting to the public. This year our scouts chose to make a pioneering see-saw and it was a hit! Troop 363 had a great showing at the event. They showed off their Paul Bunyan skills by winning the Ax Man competition. They displayed, pioneering skills, team building, EDGE and interview skills by taking 2nd place in the displays competition with the wooden see-saw display. And they exhibited their brain powers by taking first in the Founders Feud competition. The troop meeting for July 2nd will be held at the campground for Mukwonago Park. We will be retiring flags collected by American Legion Post 375. Scouts will build fires starting at 6:30 pm and begin retiring flags at 8:30 pm. Flag retirement will run until 10:30 pm. For those who wish to, overnight camping will be available. Overnight camping will not be formal, but open to anyone who wants to stay. We will have a cracker-barrel following the retirement ceremony. This past Saturday, 6 of our scouts helped clean out and organize the trailer for the 2015 camping season. Though rains threatened all day, they held off, allowing Blake, Cody, Franklin, Jack, Skyler and Taylor to complete the task. This year, Troop 363 will be attending summer camp at Camp Long Lake. We are attending week 4, which is July 19th-25th. The cost is $290 for the week. You can start selecting your merit badges and submitting them to Mr. Krohn now. Click here to see the program schedule grid which lists the merit badges available and when they are offered. A Parent's Guidebook for Summer Camp is also available and recommended reading for all parents. Click here to get the Parents Guidebook. 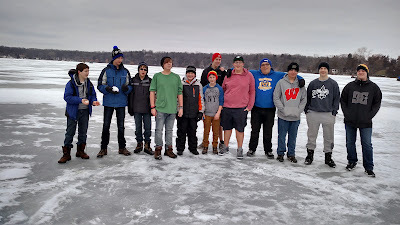 The week-end of January 24th, the scouts held their annual electronics and planning outing. 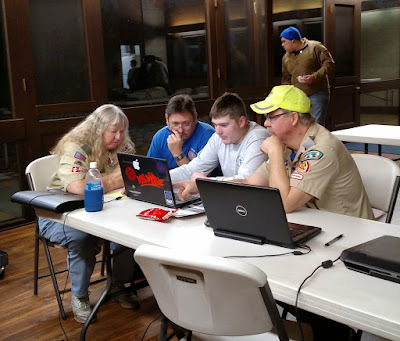 At this meeting, the scouts pick all the activities and outings they would like to do in the next year. 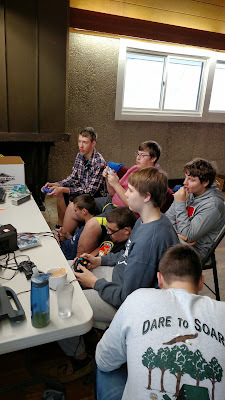 As a reward, they get to bring electronics to this outing, and play games, watch movies and listen to music. We also try to get outside a little too! You can see the results of their planning by clicking here: 2015 outings. Half the boys going to Philmont this summer had a "Shakedown" backpacking trip in June. The boys backpacked a total of 13 miles, 3 on Friday night and 10 on Saturday. The trek was from Palmyra to Whitewater. The purpose of the hike was to test the equipment being used at Philmont, and to get the boys in shape. 2 shorter hikes were done in March and April. Click here to see more photos. Help pull the invasive species Garlic Mustard which will crowd our native wildflowers and endanger forest ecosystems. Garlic Mustard will take over an area by depriving native plants from nutrients. The invasive species came from Europe, and has no predators in the United States.It is then free to grow unrestricted. Dress for the weather and bring a pair of work gloves and a water bottle. Contact Daniel for more information.